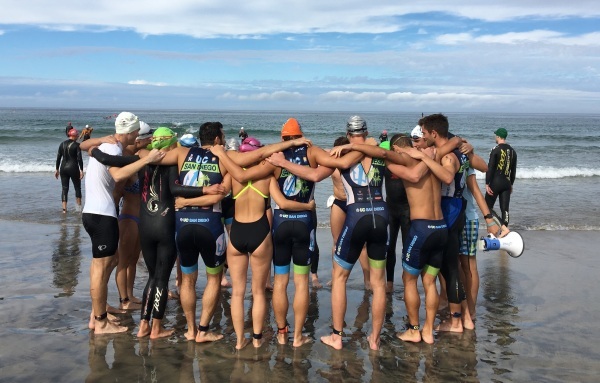 Up to the race day, I had been practicing with the UCSD triathlon team which is an awesome group of people (including our coach Kim McDonald). Those practices helped me understand the feeling from water to ground transition which was a part of the Coveskipper aquathlon. I wasn’t quite sure if I wanted to race at first because I guess I didn’t want to embarrass myself (which is not a healthy thinking so I highly suggest you to NOT do that). I also had no strategy in mind for this kind of race. However, three days before the race, I changed my mind. UCSD triathlon club was hosting the race so we all had to help set up the race. I think I was also more about getting to know the team rather than trying to finish with a fast time. I thought this was funny because when people get excited, they start questioning more and lose focus. I had to explain two other racers the swimming course over and over again. I have to admit that I was not in a race mentality when I arrived to the La Jolla Shores to help set up at 8:00 am. We were put in different groups to set up different sections of the race. I was in registration which I think was the hardest of them all (because you could face some impatient racers at the check-in table if everything doesn’t go smoothly). Luckily, we didn’t have any major problem, and once we got the hang of the check-in process, the line moved pretty fast. Although, I suggest people to register before the race day because it just takes some time to do payments and that can be stressful. After the check-in was done (I checked-in myself after everyone was done), I finally got into the race mentality. I started to feel the adrenaline building up which kept me warm because I was wearing a one piece instead of a wetsuit. I warmed up with sweet Maggie by running about 5 minutes and swimming for 2-3 minutes. As we lined up at the start line, everyone started asking about the swimming course. I thought this was funny because when people get excited, they start questioning more and lose focus. I had to explain two other racers the swimming course over and over again. But it was fine because it made me not think about the temperature of the water that I was going to dive into in a couple of minutes. Once Katie (our president) gave us the start, I realized I was too far out from the optimal swimming path to the first race buoy so I sprinted to get in line with others. This wasn’t too hard to do because I was freezing already so I had to move fast to warm up my body anyway. My experience in open water swimming taught me well so I kept my distance with others during the swim to prevent accidental kicks and drags. The visibility of the buoys and the shore was good so I didn’t have to follow people to find my way and instead I worked on my speed. The safety guards near the swimming course were also helpful for me to understand where I was supposed to go. After the second loop of the swimming (end of 750 m swim), I was happy to feel warm again. I had nothing to transition out of or into so I just threw my cap and goggles somewhere and started running. Running is not my strongest field so I started slow. The sand was soft and the sun was warming so I was okay for the beginning. But then, my calf muscles started giving in. Thankfully, I found another racer (he was in his 50s) whose pace fit mine perfectly so I followed him the whole time. He actually got me running a little faster than I would by telling me “C’mon, don’t let a 57-year-old man run faster than you!” (I made up the age, he might be younger). Also, I get bored easily during long distance races so every time I saw a UCSD triathlon club member I cheered for them. For the last half a mile, I tried my best to go faster but I guess that’s something I need to work on more because people actually started passing me towards the end (sad). As I passed the finish line, I walked straight to the grill where our awesome team members were preparing burgers for us. I ate my burger in less than a minute, and then started treasure hunting my cap and goggles. I regretted not throwing them to a more distinct corner during transition because it took me some time to find my goggles (they were hiding underneath the timing carpets). I’m generally a peppy person. Might even be a morning person, though it’s hard to tell in college when most days start after 10 AM. But it’s Halloween weekend, and my goal of getting to bed early was quickly replaced by a new goal of waking up early enough to have time to brew coffee. Third alarm did the trick. Coffee downed, car started, DJ Snake Radio turned on, and I’m on my way. I get to La Jolla Shores and park. The ocean is calm, almost as smooth as a lake. Air temp is mid-70s, skies partly cloudy. It’s another perfect day in San Diego and race conditions are as good as they get. Caffeine is starting to kick in. Looks like most of the team made it on time to help with set-up. Lots of tired faces. Maybe I’m not the only one who went out last night. Do I look tired? Nope – got my game face on. Kind of. Three hours until race start. Set-up is going smoothly. Joanna and I are tasked with filling two five-gallon water coolers, and we embark on what will turn out to be quite an adventure finding drinkable water. Walking around the Scripps campus, we find a spigot with a sign that reads DO NOT DRINK and a public shower. “It’s law that water from public showers must be drinkable, right?” Nah, too sketch. Apparently water faucets out here are as scarce as water itself. California, man. T-T T-R-I, T-T T-O-N GooooOOOOO TRITONSSS! Back at the Shores with two full coolers, other teams have arrived. There must be over one hundred racers here. Now I’m getting hype. Through registration and tatted with #71, I’m race ready. Almost – need to warm up. I take a quick dip. Water is clear and frigid but not bad with a wetsuit. Back on the beach, our team is gathering for a cheer. T-T T-R-I, T-T T-O-N, GOOOOO TRITONS!!!!! This is my first race as a Triton, and man am I ready. Coveskipper is a sprint aquathlon consisting of two laps around a quarter-mile swim course, each with an ocean entrance and exit, followed by a 5K beach run. We line up on the beach awaiting Katie’s command to start. Mass starts are dangerously fun. Imagine one hundred athletes all sprinting at once towards a single target, and add to that waves, dolphin diving, splashing, thrashing, drafting, and clawing for position. As you can imagine, it’s a good idea to expend some extra energy sprinting away from the pack early. Goggles are on tight. It’s go time. I sprint towards the water. High knees, high knees, high knees. Surf’s getting deep. I dolphin dive under a wave, push off the bottom, and come up. Surf’s shallow again so I run some. I’m behind some dude in a red cap. I dolphin dive again and somehow end up on top of the red-capped competitor. Sorry bud – all’s fair in love, war, and open water swimming. Two more dolphin dives and I’m in water deep enough to swim. I’m neck and neck with two other swimmers. Time to sprint – let’s beat these guys to the first buoy. I pull ahead a bit, but someone is right on my feet. I round the first buoy with the drafter still on my tail. I try to drop him on the turn but he’s one fast fella. We stay neck and neck through the turn around the second buoy. As we head towards shore, the drafter leaves my feet and tries to pass me on the right. I somewhat catch a wave and dolphin dive until the water gets shallow. Time to run. I reach the beach in first place, feeling tired already. I’m worried I took the swim out too aggressively, but the crowd on the beach is cheering, and I feed off that energy. One lap down, one to go. Again, I enter the ocean with high knees and then dolphin dive – or so I try. Less like a dive, more like a flop. Whatever, let’s get back in the zone. I round the first buoy and see my competition a couple body lengths back. At the second buoy, he touches my feet. Heading in towards shore, he starts to pass me. Uh-uh. I give it all I got. Forget the run, I’m winning this swim. I reach the beach a few seconds before the next guy. I enter transition and take off my wetsuit. Well, I try to. Somehow my timing chip got on the outside of my wetsuit and it takes a solid ten seconds to remove. I’m beginning to wonder if Torin was right about a wetsuit being a bad idea in a short race like this…too late to worry about that. Sunglasses on, I exit transition. I’m winded from the swim but legs are starting to feel good. Just as I start to get in the groove, two SDSU athletes pass me. “Focus on your own race,” I tell myself. Past the first turnaround, I see my teammates who, despite being exhausted themselves, exchange words of encouragement and high fives with me, a much needed boost when nearing a race’s end. I see the field closing on me. Let’s pick it up a notch. I am passed by two more runners. No more! I can see the finish line. Legs are getting tired, breathing is getting harder, heart rate is getting faster, but I push on. Almost there! I can hear the crowd cheering. Last push! I cross the finish line at 30:25, 5th place overall. My heart rate comes down and I join my teammates at the finish, smiles all around. Seems like everyone is pleased with their performances! We’ve trained hard over the past month and it showed today. But this is only the beginning of the season. 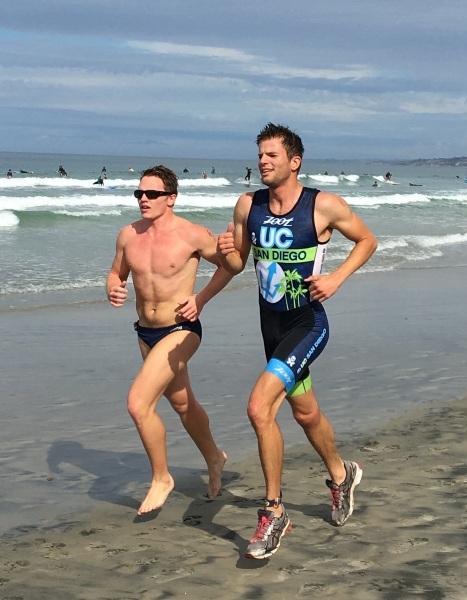 A San Diego “winter” filled with hard training and fast racing awaits!